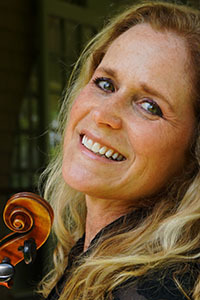 Susan Waterbury, violinist, has performed in many parts of the world, including the United States, Europe, Turkey, and China. The New York Times commended Waterbury’s playing, writing, “Waterbury’s songful flights…were especially compelling”. The Los Angeles Times wrote, “...achieved strong, characterful playing – as was the case throughout the evening – of the excellent violinist, Susan Waterbury”. Waterbury is Professor of Violin at the Ithaca College School of Music in Ithaca, NY and maintains an active performing schedule. Former faculty positions include at the Cleveland Institute of Music with the Cavani String Quartet as String Quartet in Residence, at The University of Memphis as an Associate Professor of Violin and member of the Ceruti String Quartet, and at Garth Newel Music Center as Co-Artistic Director and Artist in Residence. For eleven years, Waterbury was a founding violinist in the Cavani String Quartet. Cavani performed and taught regularly for concert series and festivals throughout the U.S. and abroad and garnered many awards including First Prize in the Walter W. Naumberg Chamber Music, Cleveland Quartet, and Carmel chamber music competitions. Cavani also received prizes in the Banff International, Fischoff, and Coleman competitions. Principal teachers were Donald Weilerstein at the Eastman School of Music; Jens Ellerman, Aspen Music Festival; Michael Davis, Ohio State University; and Walter Levin, Cincinnati College-Conservatory of Music. Extensive chamber music training was with members of the Cleveland, Tokyo, Emerson, Guarneri, and Juilliard String Quartets. Susan plays on an 1865 Postiglione violin and also enjoys playing Old Time fiddle and other improvised music with her banjo playing husband, playing on her grandfather's fiddle.